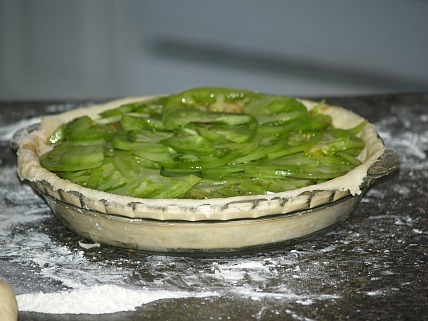 Recently, my cousin Retha requested Mom’s green tomato pie recipe. Retha lives in California. You may remember me mentioning her from time to time. My mom and Retha’s dad were brother and sister; Mom loved her just like one of us. In the fifties I went with Mom and Dad to see her pull out and head for California where they started a mineral resort still run by their family today. The gold rush!!! Anyway, Retha was a young mother with a small baby boy? She and her hubby loaded up with baby in their mobile home. We watched as they pulled away from the hillside where they lived to head west. I could feel the sadness from my aunt and uncle (Retha’s mom and dad) and my mom and dad. At that time, remember California was a world away; not like today. I was probably ten years old and for me I felt excitement for this young family as they traveled to this new exciting place; not like “boring Ohio”. Don’t get me wrong, I love Ohio and all the WONDERFUL memories of growing up there. Just like Mom’s green tomato pie recipe and her other old traditional recipes and all of Dad’s cooking; this is why I do this website. 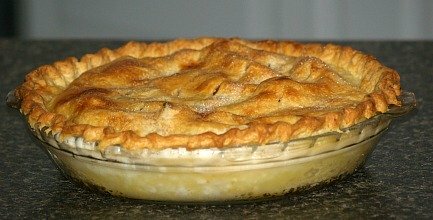 I am so grateful to Retha for bringing Mom’s green tomato pie recipe to my attention. Mom made so many old fashioned pie recipes but I didn’t remember this one. I began searching through all my notes from family recipes; I started calling the siblings who we have left on this earth. Through all this I discovered some other interesting tidbits. When searching for this green tomato pie recipe, there are some things I knew about Mom’s cooking to lead me in the right direction. First, all pie dough was made with a lard and flour base; she never used such things as a cookie dough crust or graham cracker crust. Another thing I knew is that it had to be sweet; I don’t remember anything but sweet pies. This rules out most of today’s green tomato pie recipes with all the different cheeses; another thing is that we didn’t have cheese like that. Just to add an interesting note about Mom’s pie baking. Dad always said Mom’s pies were not the most beautiful but they were the best tasting. This is because most of her life was during the times of rampant diseases; tuberculosis, smallpox, measles and I even remember people dying from polio. As a little girl, we would walk into town to pick up our mail (we had no addresses); Mom always covered my face with a clean handkerchief when we walked pass the few houses along the way. It is hard for us to envision that kind of life today but Mom took it very seriously. She was a fanatic about cleanliness and this was reflected in her pie making! She would not touch any of the food which she prepared. When it came to pie making she managed to roll the dough and complete the pie without touching the dough. My first call was to Sister Donna. Although she, like all of us loved Mom’s cooking especially her pie recipes, Donna couldn’t remember anything about the green tomato pie recipe. We all remember the rhubarb pies and the many wild berry pies. We had a huge mulberry tree when we were young growing up the side of the house. We could climb out the upstairs window into the tree. All of us kids would climb this tree to pick mulberries; Mom would take these and make pies. Brother Larry did not remember the green tomato pie recipe but quickly asked me if I remembered her pies made with the ground cherries we raised. I could always count on brother Larry for good information! I couldn’t remember any ground cherries and I didn’t even know what those are. He went on to explain that we grew them and they were also called tomatillos (but they are different from tomatillos) describing them to look like small green tomatoes; Mom made pies with these. They are sour and many of these recipes are titled sour cherry pie. Right away Sister Shirley remembered Mom’s green tomato pie just like our cousin Retha did. She said it was so delicious! My sister could not remember the ground cherries or sour cherry pie but thought my brother had mistaken that pie for Mom’s gooseberry pie recipe. When she was young she would pick gooseberries and Mom would make pies from those. A call to Brother Jake shed some more light on the subject. He remembered us growing the ground cherries and confirmed Mom making a sour cherry pie from them. It seems we only grew the ground cherries for a few years. The first of the following recipes is what I am sure is Mom’s green tomato pie recipe. As I said it is sweet containing sugar, seasoned with cinnamon and nutmeg, flavored with butter and vinegar and thickened with flour. These are all ingredients which we would have had in our kitchen. Preheat oven to 400F degrees; line bottom of 9 inch pie pan with dough. Sift all dry ingredients together; sprinkle a little over bottom of unbaked pie shell. Put in a layer of tomato slices; sprinkle a layer of dry ingredients over the top of tomatoes. Continue with layers of tomatoes sprinkling each layer with dry ingredients. Dot top with pieces of butter; drizzle vinegar over the top. 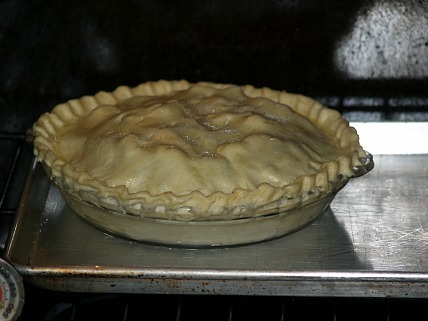 Wet the rim of the lower pie crust; top with rolled pie dough and crimp edges to seal. With sharp knife cut openings in top crust to let steam escape. Bake at 400F degrees for 15 minutes; LOWER HEAT TO 350F degrees and bake about 50 minutes longer. Dot top of fruit with small pieces of butter. Roll dough for top; wet edges and place dough on top and pinch to seal. Slash several places with knife to let steam escape. Bake in preheated oven at 450F degrees for 15 minutes. Reduce heat to 350F degrees and bake 30 minutes longer. Combine all ingredients EXCEPT butter; mix well together. Line a large pie plate with pastry rolled pastry dough. Pour filling mixture into pie shell; dot top with butter. Cover filling with a top crust cutting a couple steam vents; trim and crimp edges. Bake about 40 minutes until tomatoes are tender. Roll half of dough and line a 9 inch pie tin. Pour water over tomatoes in skillet; simmer until tomatoes absorb most of water and are tender. Add raisin to the skillet and simmer 2 minutes longer; drain off all liquid and SAVE. Place tomatoes and raisins in lined pie tin; sprinkle top with sugar mixture, cinnamon, ginger and nutmeg. Dot top of pie with butter; add grated lemon peel and lemon juice. Pour brandy over the pie; roll out remaining dough and cover pie cutting slashes for steam vents. Trim off excess dough and crimp edges. Bake at 450F degrees for 15 minutes; REDUCE HEAT to 375F degrees and bake another 30 minutes until browned. Try this green tomato pie recipe with apples baked in a flat pan. Combine flour, powdered sugar and butter; work with fingers into a dough. Pat dough into the bottom of a flat pan. (I use one measuring about 4 ½ inches by 14 inches). 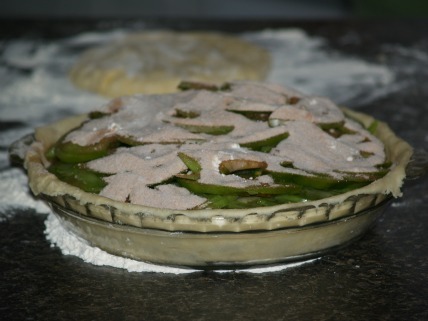 Place apple and green tomato slices alternating and overlapping overtop of the dough. Sprinkle top generously with the lemon juice; mix sugar and cornstarch and sift over the top. Bake 50 to 60 minutes until apples and tomatoes are tender. Spread warmed jelly over top; serve with shipped cream.